Ramapo Orthodontics is a certified Invisalign provider for Suffern & Mahwah. Invisalign® and Invisalign Teen® can provide a simple way to improve your appearance and your lifestyle, without having to put your life on hold. If you are an adult, you may be trying to improve your smile for social or business reasons, or maybe a special occasion. Teenagers may only need mild to moderate corrections and are looking for a more modern option than traditional metal braces. Invisalign offers convenience and flexibility to achieve the smile you always wanted, without the hassle of brackets and wires. At Ramapo Orthodontics, we can answer all your Invisalign questions and determine if you are a good candidate for Invisalign clear braces. 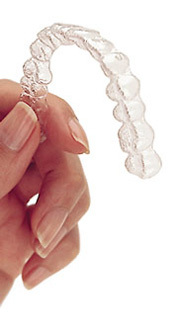 Invisalign aligners are made of a nearly invisible plastic. You will be pleasantly surprised to find out how many people won’t even notice you’re going through orthodontic treatment. Without the irritating wires of traditional braces, you won’t have to worry about food restrictions or how to maintain your oral health routine. Although patients are required to wear their aligners for up to 22 hours a day, Invisalign’s clear trays are removable at any time so that you can eat normally, and brush and floss as usual. can remove the liners to insert your sports mouthguard as needed. Invisalign for teens also has an additional feature to make straightening your teeth easier. There are small blue dots on the outside of the trays that go from blue to clear when that particular tray has corrected as much as it can. Then you know it’s time to move on to the next tray, and the next stage in your treatment. At Ramapo Orthodontics, we use digital imaging technology to map your treatment from start to finish. We plan out a series of aligners for you to wear in stages. Each stage of Invisalign clear braces are worn for about two weeks, and you will need to schedule a check-up for every six to eight weeks to make sure your progress is on track. Rinse your aligners every night and brush them gently with your toothbrush to keep them fresh and clean. Today more than ever both teens and adults are discovering that Invisalign clear aligners are perfect for their mild to moderate orthodontic needs. If you are interested in perfecting your smile using this method, give our office a call today and schedule a comprehensive evaluation.